There are great writers, and then there are writers whose talent is so overwhelming they join the pantheon of genius scribes whose work lives on for centuries: Sophocles, Shakespeare, Mary Shelley, Harper Lee, Maya Angelou. One of the brightest stars on that list is Toni Morrison, whose new novel God Help the Child proves once again that’s she’s a force of nature. Yep, the author of Beloved, Song of Solomon, Sula, The Bluest Eye, and Tar Baby has done it again. I love Morrison now, but when I first encountered Beloved, I had no desire to read it. Back in high school, when I thought my parents had the worst taste in, well, everything, my mom handed me a copy of Morrison’s Pulitzer Prize-winning novel about Sethe, an escaped slave haunted by the ghost of her child. Figuring the book would be about as lame as my mom’s Barbara Streisand Superman album (no disrespect, Babs), I stuck it on a shelf in an act of defiance. A really lame act of defiance, but still. Months later, desperate for something to read, I yanked Beloved off the shelf and gave it a shot. From the first few sentences I was pulled in, mesmerized, and completely in awe. I’d never read anything like it. The words and images flowed together in a way that electrified my mind. As soon as I finished the book, I read it again. I wrote papers about it, told everyone I knew to read it. When they announced the movie version of the book I was livid, because I knew no one — not even Oprah — could do the story justice. I went to see the movie alone, with a huge chip on my shoulder. I walked out halfway through, feeling like someone had disrespected my entire family and everything I believed in. Dramatic, I know, but I just really loved that book. And now here we are, years later. Morrison has written several books since Beloved, she’s won the Nobel Prize, and her latest book has just published. It’s one of the most anticipated novels of the year, and Morrison’s story about the ways childhood trauma and experience carries through into adulthood is haunting, odd, moving, and, in true Toni Morrison fashion, like nothing I’ve ever read. Legendary film director Samuel Fuller used to say the key to a great film was grabbing people by the balls from the first frame and not letting go until the end. Morrison is an expert at grabbing you from the first page and pulling you into the story and into her wild imagination until the final page. “It’s not my fault. So you can’t blame me,” says Sweetness (a character who is anything but) on the first page of God Help the Child. What’s not her fault?! What the hell did she do?! And then you turn the page. You won’t find a Toni Morrison book full of characters named Jennifer, Pam, Bob, and Timmy. You will find characters called Bride, Sweetness, Raisin, and Queen Olive (pronounced Ol-li-vay, FYI). Granted, most of them are nicknames. Bride, the main character in God Help the Child, is really Lula Ann, but she changed her name when she left her cold-hearted mom Sweetness, transformed her life, gave herself a makeover, and became a high-powered cosmetics entrepreneur. The names are part of the off-kilter, magical, brutal universe Morrison conjures up in all her books. “What you do to children matters. And they might never forget,” Sweetness says early on in the book, which is told through shifting points of view — which is not an easy feat to pull off. Morrison isn’t afraid to play with structure, time, and magic. Characters age backwards, clairvoyance exists, ghosts are real, and miracles can happen. Morrison’s talent is frightening, and she never takes the safe route with her stories. God Help the Child, like most of her work, is dark. She writes about child abuse, death, kidnapping, sexual molestation, abandonment, infidelity — topics that would make you run and hide under the covers in the hands of a lesser writer. She lightens the narrative here and there with some subtle humor, but you’ll go to some dark places with Morrison, because she’s that good. And there’s always a reason, a lesson, a catharsis at the end. The end of God Help the Child is chilling, and the words stick in your brain long after you finish the book. The novel is Morrison’s first story set in modern times, and still the world is unique, with fairy tale elements, yet familiar. The characters stay with you, which is what any great novel should do. Bride, Sweetness, and everyone else in the novel are not soon forgotten. They’ll haunt you, in the very best way. 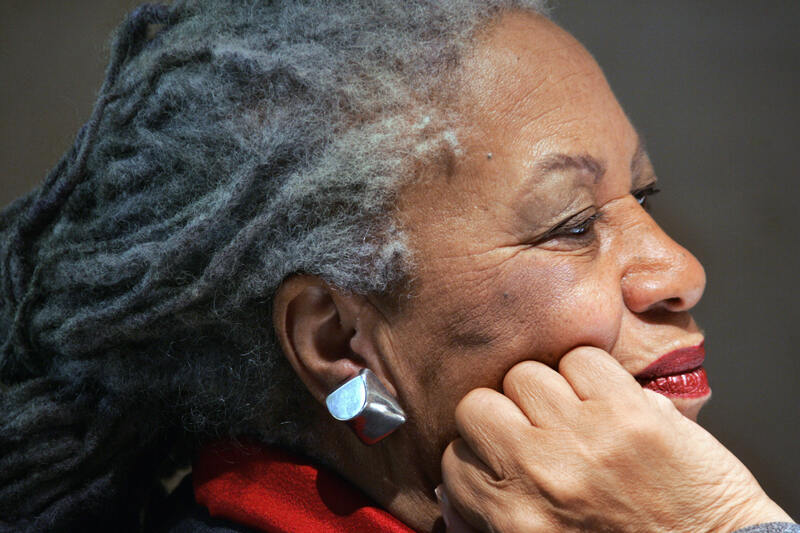 If you want more Toni Morrison, check out Linda Wagner-Martin's book Toni Morrison: A Literary Life , also out this month.